I'm using SharePoint Designer 2013 with SharePoint Designer 2010 workflows and am trying to figure out how to retrieve the user data from the Collect User Data when there are multiple items. Presently, I have six custom form fields for the user to fill out in the "Custom Task Wizard" and I want to store the user-input values to columns in my list. I'm using the "Set Field In Current Item" to Set the field using the value from the user-input. 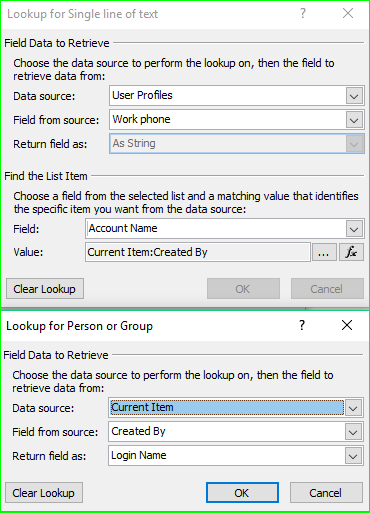 I had read here: Getting information out of a collect data from user task to use Data Source: Association: Task List, Field From Source: ID, and then under "Find the List Item" use Field: ID. For the Value part, do I use the custom form field names, or the numeric id? If I use the custom form field names, how do I account for spaces in the names? If I use the numeric id, does the first entry start with 0 or with 1? Helló! An example: if you would find the "Work Phone" parameter of the user, who created current item, you should set the Value property to "Current Item:Created by", and choose in the popup window Login name, or string. As my experienced, the User ID number is not accurate. If you go with custom form field, you don't need to worry about the spaces, the software doesn't use the visible name, but the field ID. Not the answer you're looking for? Browse other questions tagged workflow designer-workflow or ask your own question.